A recent client hired us to replace his electrical sewage controls and install a new septic pump in Cape Fair, MO on Table Rock Lake. His septic tank is located adjacent to his walkout basement on the lake side. The septic pump was housed within the septic tank and pumped effluent up to a single pass sand filter at a higher elevation on the opposite side of the home. For more information on our septic and sewer pump services check out an earlier post I had for the Types of Sewer Pumps we Service. The original failing septic pump and controls were of a well recognized name brand system used by many septic installers and plumbers who provide sewer pump repair in Cape Fair. However, upon inspection of the original pump we instantly knew it was undersized for the sand filter. The pump did not have the adequate flow capabilities to properly distribute the effluent over the sand filter. We have seen this same scenario numerous times. Uninformed plumbers and septic service providers will rely upon manufacturers or vendors to supply them with the correct pump and control panel for the application. Unfortunately, many homeowners end up with inadequate systems. Our recommendation was to replace the existing septic pump system with our Visi-Pump system. We first installed our diagnostic system. This puts our customers back in service immediately while providing the information needed to customize our new replacement system. This allowed us time to further research the existing sand filter to help verify some of the original installation details. After obtaining all available data we were able to customize our Visi-Pump system to the client’s exact application. We used our test facility to physically set up the actual pump and controls of our new system under similar conditions in which it would be operating in the field. All of our new septic pump systems undergo rigorous testing procedures before being put into service. An interesting discovery was made during the installation. When pumping the septic tank which housed the pump, we found a large amount of dirt and rock in the tank. There was no way to correctly install our new equipment without removing it. 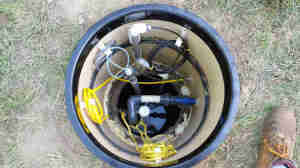 A confined space entry was required to physically enter the concrete tank to remove the debris. From there it was shoveled into five gallon buckets and hoisted out through the access riser. Based on the size of rocks removed it was obvious that most of the debris had entered the tank during the initial installation. However, there were also unsealed pipe penetrations at the inlet and outlet of the tank allowing additional dirt and rocks to enter the tank. Once the debris was removed the pipe penetrations were sealed by our technicians. We also sealed the riser to the tank to prevent ground water and silt infiltration. A custom filter/septic pump housing was installed in the tank which includes a monitoring device to alert the homeowner when the septic pump filter screen is in need of service. The filter screen is necessary to keep larger particles from entering the sand filter. If improperly screened particles are allowed to be pumped to the sand filter it can cause the sand filter to fail. Once the new Visi-Pump system was installed we were able to properly flush the distribution lines of the sand filter. The old system had never had the capability to adequately flush these lines. The Visi-Pump controls were first set to the required orifice flow rates of the sand filter distribution lines. Only Visi-Pump systems have the flexibility of variable flow rates. This ensures the sand filter will be receiving the correct volume of effluent allowing maximum treatment efficiency before being released into the soil. Next the settings for properly time-dosing the sand filter were entered into the system. I was encouraged with the homeowner’s level of interest in wanting to learn all he could about the new system. He was helpful during the process of establishing the final settings of the septic pump system. It is always good to see a homeowner who understands the value of having a properly operating wastewater treatment system. His diligence in ensuring his system is working properly will continue to help protect the environment in Cape Fair, MO including the water quality of Table Rock Lake.